Ratko Mladic, also known as the "Butcher of Bosnia," was convicted of Srebrenica massacre by the International Criminal Tribunal for the Former Yugoslavia (ICTY) on Wednesday. He faces a life sentence in prison. Despite the verdict, many critics aren't thrilled with the tribunal court that dealt the hand to Mladic. In fact, many question its legitimacy. ​Speaking to Sputnik Radio's Loud & Clear, Christopher Black, a lawyer qualified to practice at and on the list of counsel of the International Criminal Court, says the tribunal is really just a setup for NATO, which will use it to ensure the bloc's interests. "It's quite clear that [NATO] wanted to set up a tribunal they could totally control," Black told show host John Kiriakou. "[The] tribunal was set up as a NATO tribunal and [it's] really using fascist methods." Black says the protocols allowed in the tribunal are outrageous, as the court allows secret witnesses, many of which are never even seen, while others are completely "scripted." "They're told what to say," Black said. "Lawyers who really want to fight are not allowed in, and lawyers that play the game are," Black adds, describing the unfair methods he's witnessed in the court. "So they run it, they arrange it in many different ways, but they essentially control the mechanisms and the outcomes of these trials and even the convictions… even the acquittals are arranged politically if there is an acquittal." Kiriakou asked about the chances of the 74-year-old former general in the court's appeal process, as his lawyers have promised to appeal the decision. "The appeal is one of the problems of the appeal, [because] there is no separate appeal chamber," Black said. "The appeal chamber, as they call it, is composed of judges rotated in and out of the trial chamber, so they're not a separate body at all." "They circulate, so there is no separate appeal chamber, [so an] appeal on his charge now would be very, very difficult," he added. After remarking on NATO Secretary Jens Stoltenberg's comments about how the Mladic verdict brought "an end [to the] dark chapter in the history of Europe," Black surmised that the trial was really all "about [NATO] securing the Balkans so they can eventually complete their encirclement of Russia… that's what the whole thing is about." Ratko Mladic (74), the former leader of Bosnian Serbs and a military commander, has been charged with having committed genocide, war crimes and crimes against humanity during the 1992-1995 war in Bosnia. Mladic denied all accusations. 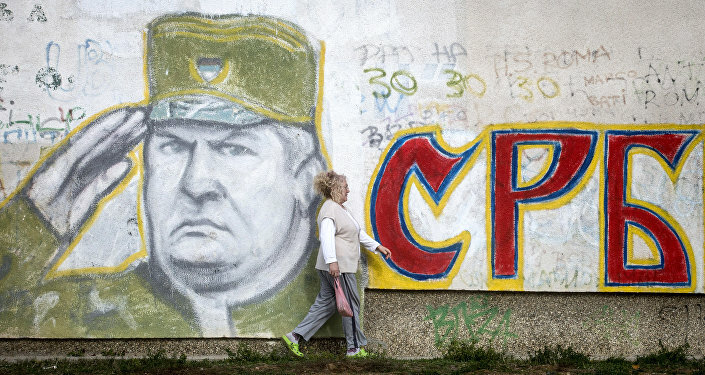 The trial against Mladic began on May 12, 2012 after his arrest by Serbian authorities a year earlier; the former commander had been in hiding for years before his capture. In December 2016, prosecutors demanded a life sentence for Mladic for his role in the alleged killing of 8,000 Muslim men and boys during the July 1995 Srebrenica Massacre, for the protracted siege and bombardment of the Bosnian capital of Sarajevo and the "ethnic cleansing" of Muslims and Croats in other areas. The ICTY found him guilty of multiple charges including of genocide of Bosnian Muslims and Croatians, crimes against humanity and war crimes, committed during the Bosnian War (1992-1995), in particular, of the Siege of Sarajevo and and the Srebrenica massacre.